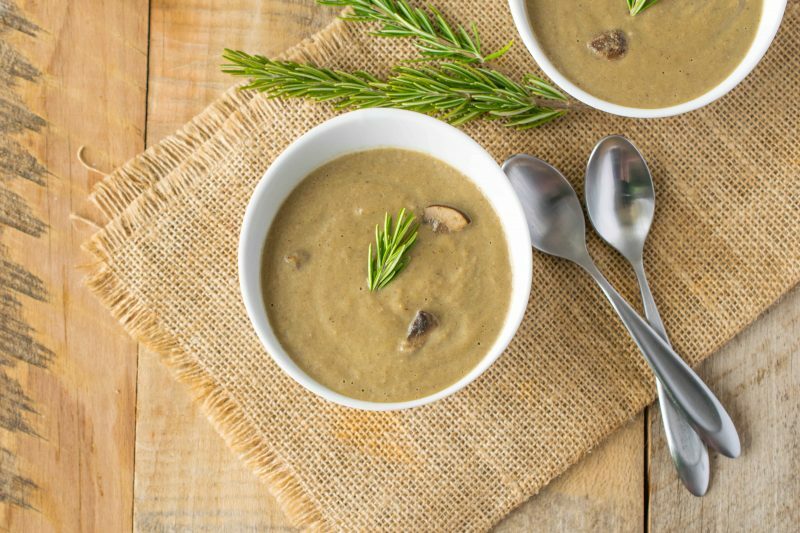 This Vegan Mushroom Soup is so hearty and delicious and it’s dairy free. With delicious flavors from rosemary and coriander, this soup is healthy, low calorie and just as satisfying and creamy. Read on to find out how the soup gets its creaminess. This recipe came about by accident and wasn’t trying to make a vegan soup. I had some friends coming over for dinner and as it can happen, I was informed one of my guests is lactose intolerant. Well, there went my cream of mushroom soup idea. Or maybe not. Did you know that you can make a soup thick and creamy without cream? After having to re-work my recipe, I researched a substitute for making soups as rich and delicious as they are when you add cream. Turns out raw cashews work really well and so does potatoes. I used sweet potatoes in my zucchini and sweet potato soup and it is so creamy. If you don’t want to use nuts of any kind, you can substitute a small potato. Just peel, chop and add in place of the cashews. 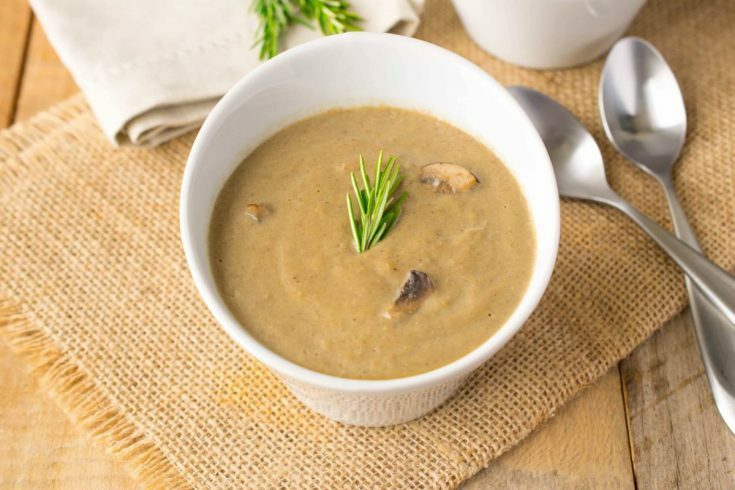 I promise, you wont miss the cream in this vegan mushroom soup and those of you who are not able to tolerate dairy and missed out on all those creamy soups, this recipe is for you. I’ve tried the recipe a few times and this is the best tasting so far. The difference this time, I used dried porcini mushrooms and reconstituted them in warm water. This created a mushroom broth that I think gives the soup the extra mushroom flavor boost. I also reserved some of the cooked chopped mushrooms before blending the soup because I think it’s nice to have some texture and a bite to the soup and it’s not completely puréed. I’m seeing mushroom broth available in the stores. If you can find it, you can skip the steps in the recipe for making it and proceed from step 5. 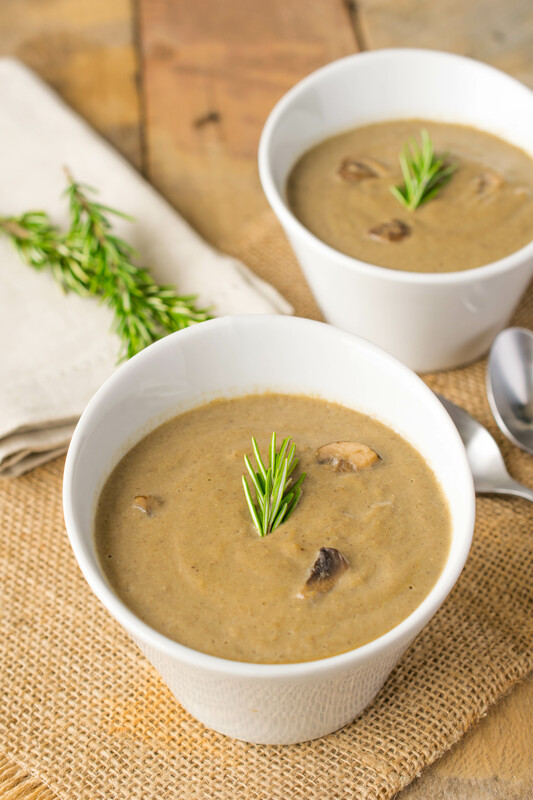 If you’ve tried this Vegan Mushroom Soup or any other recipe on the blog then don’t forget to rate the recipe and let me know how it turned out in the comments below. I love to hear from my readers! You can also FOLLOW ME on FACEBOOK, TWITTER, INSTAGRAM and PINTEREST to see daily recipe updates. 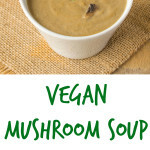 This vegan mushroom soup is so hearty and delicious and it's dairy free. 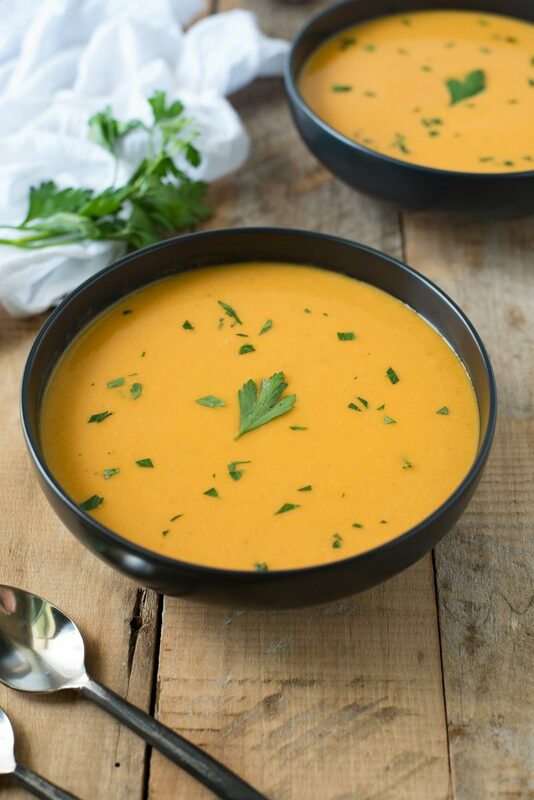 With delicious flavors from rosemary and coriander, this soup is healthy, low calorie and just as satisfying and creamy. In a large bowl, add the 4 cups of lukewarm water. Add the dried porcini mushrooms and allow to sit for 30 minutes to reconstitute. This will also be the mushroom stock for the soup. Using a sieve, drain the reconstituted porcini mushrooms. This is in case there is grit. Save the liquid to use later. Chop the reconstituted porcini mushrooms the same size as the other mushrooms. In a large saucepan, heat the olive oil over medium-high heat. Add all the mushrooms, including porcini, sauté until soft. Remove 1/3 of mushrooms and set aside to add to soup later. Add the leeks, salt and pepper.. Continue to sauté until leeks are soft. Add the garlic and rosemary, cook for 2 minutes. Add the cashews and mushroom stock. Bring to a boil, reduce heat and simmer for 15 minutes. If you have an immersion blender, use this to blend the soup in the pan. If not, transfer 1/4 to a blender and blend until smooth, if it's too thick, add vegetable stock to get the consistency you like. Transfer to a bowl and continue with the rest of the soup. Put all the soup back into the soup pan, add the mushrooms that were set aside. Reheat and test for seasoning, add salt if needed. Serve. *The 1oz of dried porcini mushrooms equals 4oz of fresh porcini mushrooms after reconstituting. If you can find mushroom broth in the store, you can skip steps 1-4 and proceed from step 5. I’ve made this a few times, it’s my favorite mushroom soup recipe. I used a potato the last time because I didn’t get cashews and it’s just as good. This is a really good mushroom soup. My wife is vegan so I made it for her and I enjoyed it too. I substituted leeks for onions and it still turned out very nice. I’ll make it again. I’m so glad. I’m not vegan or vegetarian and enjoy this soup so much too. 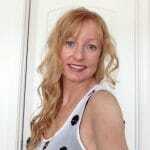 I love using raw cashews to make “creamy” recipes. Your soup looks amazing, the texture is fabulous! This soup looks so creamy and delicious! Will try this soup sometime. So cold today and a bit of a snow. Perfect weather for this lovely soup! Oh I’m loving the sound of this! I tried to make a vegan creamy mushroom soup the other day using cauliflower. It was awful! Cashews sound like a much better alternative! This is so pretty. This whole recipe is a departure for me. I haven’t made homemade mushroom soup or a creamy soup like this. A new culinary world awaits! I love this idea. I really want to try it. I am into making vegan soups lately and this looks so delicious, nicely done! As a healthy blogger (and eater! ), I’m always looking for great new ways to make really creamy dishes (from pasta sauces to soups to dips) without using the typical, full-fat dairy products that most people think of when they think “cream.” This recipe is just a phenomenal idea – so much healthier and still so wonderfully rich and creamy! Definitely pinning this! I love mushroom soups but I am REALLY loving the sound of this one with no cream! I’ve never used cashews in this way before but I cannot wait to try it! This looks awesome! I’d love to have this for lunch today. Nom nom!